Is Language Important for the Critical Tasks of Your Organization? A language strategy can turn out to be a necessity to create distinctive value for stakeholders. Is Your Organization Serving Customers Globally? To access global markets and build accessible global brands, dispersed workers must be able to engage with external international partners and customers effectively. Is Your Organization Expanding Globally? A common language helps accelerate the integration of new entities from different regions by helping achieve efficiency in migrating onto common platforms, sharing resources, strengthening internal communication, and fostering cohesion in the newly formed organization. Do Members of Your Organization Need to Collaborate Across Borders? Globally dispersed workers who have interdependent roles internal to the organization need a shared language in order to communicate effectively, whether they need to exchange knowledge or collaborate on joint projects. Does Your Organization Need to Standardize Technology Platforms? Enterprise software in an organization with global operations can proliferate into many disjointed tools that obstruct a clear view into operations, financials, customer insights, and employee data. Full standardization across platforms, built on a common language, can solve that problem. Every organization has its unique concerns, but depending on the scope, scale, and urgency of these factors, a common-language strategy may be appropriate. 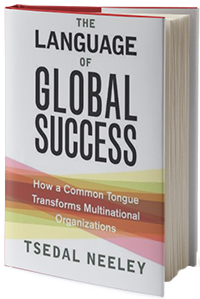 Discover the full process of implementing a language strategy into your organization by reading The Language of Global Success by Tsedal Neeley. Feb 12, 2018 [QUIZ] Are You an Expat in Your Own Country?